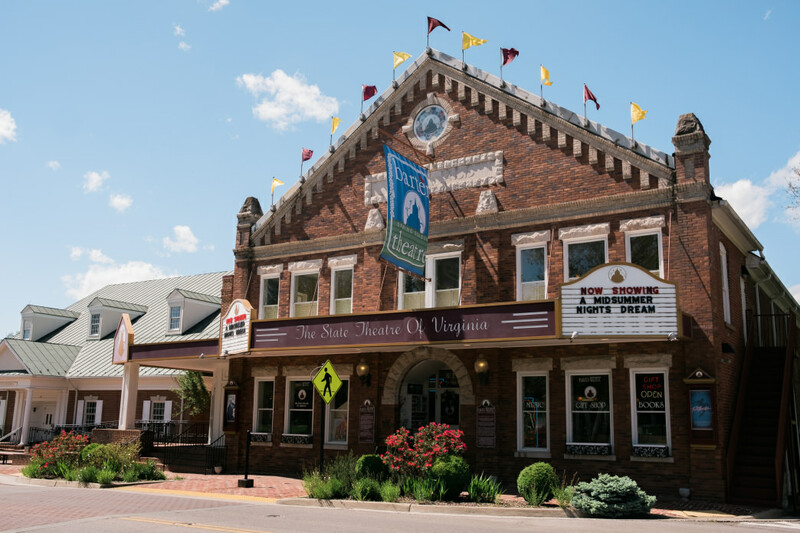 Tucked into the hills of Southwest Virginia, and connected by the famous Virginia Creeper Trail, the neighboring towns of Abingdon and Damascus have all the essentials of a weekender’s paradise. From charming restaurants and storefronts to endless outdoor adventures, these charming small towns have the perfect combination of activities for a well-rounded weekend getaway. Visitors will find rich history, unique outdoor recreation, fine dining, and much more. Though Abingdon and Damascus are small, their wealth of culture and lively atmospheres will make you think you’ve discovered a whole new world hidden in the beautiful landscapes of Southwest Virginia. A stroll down Abingdon’s delightful Main Street is a great way to start your excursion, with its brick sidewalks doubling as a viewing platform for two centuries of architecture. Here, you can peruse local art galleries, visit Katbird’s Wine and Gourmet, Abingdon Olive Oil Company, and stop in for a root beer float at the 1950s-style soda fountain. On Tuesdays and Saturdays, you can find the farmer’s market nearby, offering fresh local produce and baked goods. 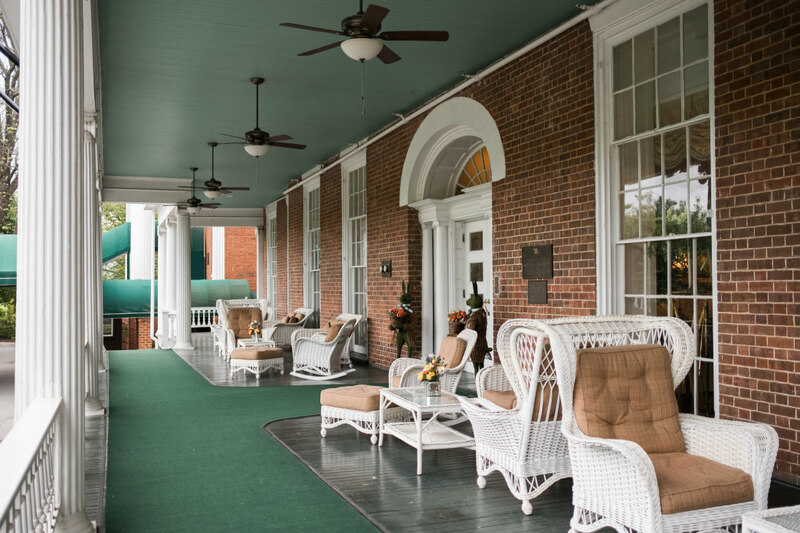 The Martha Washington Inn and Spa stands elegantly on Main Street, inviting guests to experience its well-preserved 19th century architecture, or enjoy a meal at Sisters, its American grill. Abingdon offers a wealth of dining options, perhaps most notably The Tavern, which was built in 1799 and is the oldest of Abingdon’s historic buildings. A few blocks off Main Street, visitors can enjoy craft beer at Wolf Hills Brewery in a more laid-back atmosphere, often with live music from local artists. The hub of Abingdon’s music and art can be found a few minutes out of downtown at Heartwood: Southwest Virginia’s Artisan Gateway. 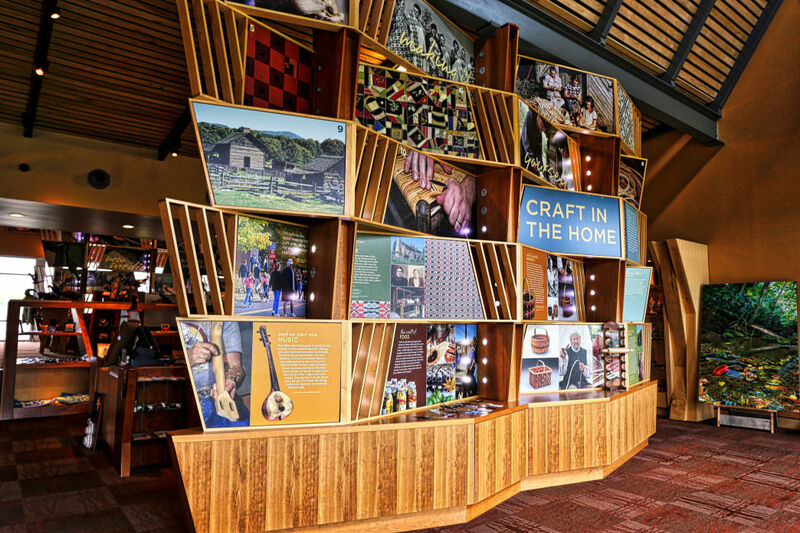 Here visitors can admire unique crafts from dozens of carefully selected regional artists before enjoying a meal or a drink at the cafe. Heartwood’s chef is passionate about reinterpreting traditional dishes of Southwest Virginia, and upholds Heartwood’s commitment to the community by using locally sourced ingredients whenever possible. Heartwood is also home to The Crooked Road: Virginia’s Heritage Music Trail, an organization dedicated to sharing and celebrating traditional music. The Crooked Road spans 19 Virginia counties and includes 60 venues that showcase the music of Southwest Virginia, from bluegrass to gospel. At Heartwood, The Crooked Road presents live music every Thursday night— plus some good ol’ southern barbecue! Abingdon remains in touch with its roots through more than music, with many preserved sites where people can interact with the area’s rich history. Visitors can spend hours at the Abingdon Muster Grounds, which has a museum on colonial and revolutionary history, reenactments, a visitors center, and hiking trails. If that doesn’t scratch your history itch, visit the Old Mollie Steam Engine, or take an Abingdon Spirit Tour and learn the town’s lore. At the heart of Abingdon is the Barter Theatre, a locally operated theatre situated on Main Street across from the Martha. The Barter Theatre opened its doors at the height of the Depression in 1933 under the ownership of the actor Robert Porterfield, who had the idea to let people barter their way into the theatre. Townspeople would offer up whatever they could: cow’s milk, eggs, unsellable produce, homemade jam and so on. The business was wildly successful and today the Barter sees more than 160,000 guests per year. Damascus, a few miles eastward, is equally full of character, wrapping small-town charm and thriving tourism into one funky little package. The lively atmosphere cleverly disguises that the population of Damascus, the gateway to Mount Rogers National Recreation Area, is less than a thousand. What it lacks in people, though, it makes up for in trails, trees, and beautiful Virginia scenery. The Appalachian Trail runs directly through Damascus— literally, right down Main Street, making Damascus the resting place of thousands of thru-hikers every year. In May, the town hosts the Trail Days festival, with parades, talent shows, concerts and more for hikers and other visitors. 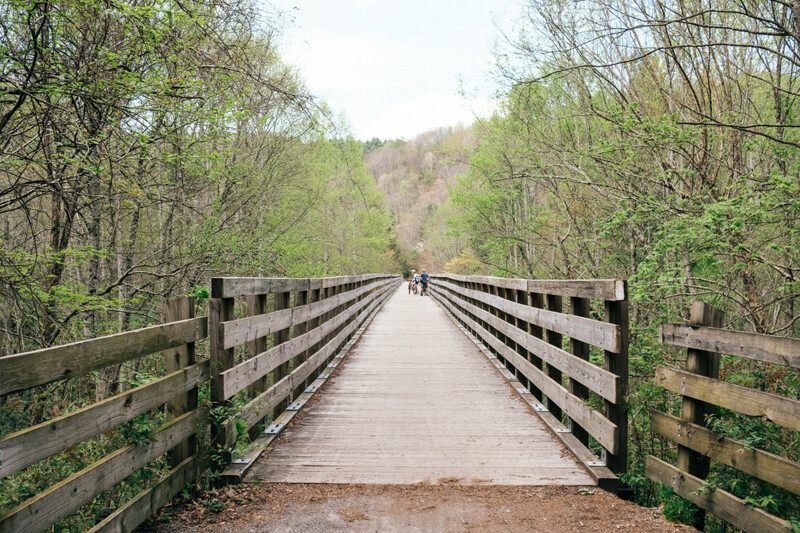 Other nearby trails include the Trans-America National Biking Trail, the Iron Mountain Trail, the Daniel Boone Heritage Trail and, of course, the renowned Virginia Creeper Trail. The Virginia Creeper Trail is a 34-mile, rail-to-trails path that begins in Abingdon and terminates near Whitetop Station. Biking the famous trail is a popular activity for visitors to the area, with options to bike parts or all of it. Abingdon and Damascus bike shops offer rentals and shuttle services for the Creeper Trail. Take the shuttle to Whitetop Station and enjoy the incredibly scenic ride back to Damascus, which is almost entire downhill. It’s also a great area for fishing, horseback riding, birdwatching, and hiking or running. Damascus offers various lodging options, including B&Bs, hostels, campgrounds and inns. The Old Mill Inn is located in the heart of Damascus and is a historic grist mill perched on the banks of Laurel Creek. Visitors can stay overnight in the 12 rooms, or drop by and enjoy a meal from the inn’s spacious restaurant on one of the three back decks overlooking the creek and the mill waterfall. Other restaurants in Damascus include Mojo’s Trailside Cafe and Coffeehouse, a great breakfast spot, and Bobo McFarlands, a not-so-Irish pub that’s a favorite hangout for thru-hikers. For a variety of delicious beer, there’s Damascus Brewery, a one-man operation located on the outskirts of town that offers up 47 fantastic micro-brews. Damascus is also a wonderful locale for horseback riding, as it’s near the Virginia Highlands, the Virginia Creeper Trail and Mount Rogers National Recreation Area. Several local outfitters offer guided horseback riding trips in the area. Whether you visit for a few hours or a few days, on two wheels or four, you’ll find yourself immersed in Virginia tradition and surrounded by some of the Southeast’s most spectacular scenery. Abingdon and Damascus are bursting with recreation and entertainment for people of all ages, and the fusion of modern luxuries and historical marvels will make you feel uniquely welcome in these charming communities.